One of those seismic shocks came in the women's division when the much-fancied Thai champion at 51kg was defeated by a new comer from Chinese Taipei. Nantida Usadee lost out to Kai-Hsuan Cheng in a stunning defeat early in the afternoon. 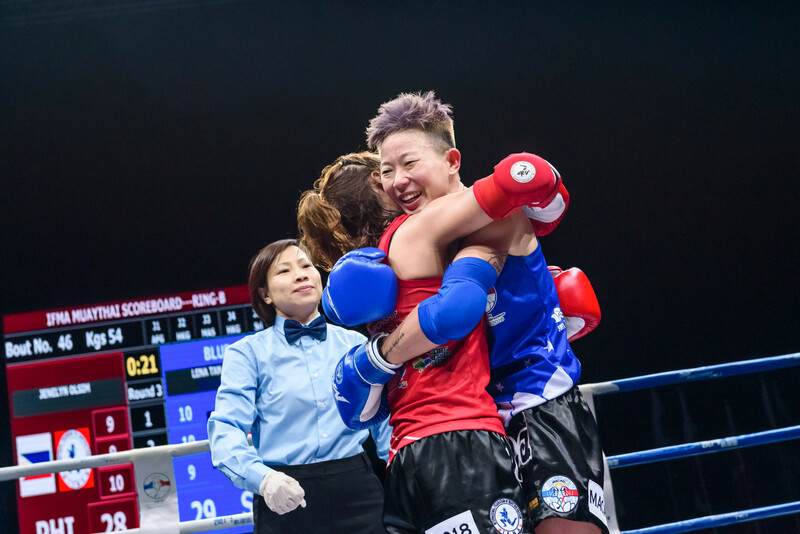 It was a clear marker that smaller muaythai nations like Chinese Taipei have learned lessons from previous tournaments, and the narrative is very much changing in the rings. This was matched at the other end of the session when Iranian star and The World Games medalist Massoud Minei went out in a very tight contest against China. Guo Dongwang battled all the way, with the athletes lying even at 19:19 after two rounds. Guo took the final round by the narrowest of margins, winning on 29:28 after a very technical display relying on knees and clever throws. Local hero Tak Chuen Suen won his bout on points for Macau, facing into a tough contest next against Yelaman Sayasstov (Kazakhstan) - current The World Games and FISU champion. The hosts have four athletes guaranteed medals this week, just have to see what colour they each take. Thailand had a successful day today with five wins from seven bouts, but they didn't have things all their own way as with that opening defeat. A win for Saengda Sarawut at 71kg against Iraqi athlete Akram Alanisi also came down to who could take the points in the final round - just a few years ago this tight result involved Iraq would have been unheard of so things have clearly turned around for that federation. Among other bigger teams Kazakhstan still have seven athletes hunting for medals. Albina Kulbizekova who first represented Kazkahstan at the FISU WUC in July faces the sole athlete remaining in the tournament from Australia next. Yolanda Schmidt defeated her Thai opponent today in a fast-paced points victory, taking a coveted win for the Oceania region. Speaking afterwards she said she was nervous for the first round but soon realised that she could take the upper-hand. The other Kazakh athletes still competing include The World Games medalists Yelaman Sayassatov who defeated Iraq today and Almaz Sarsembekov. Singapore's Lena Tan Yi Hui took a points win against FISU and South Asia medalist Jenelyn Olsim (The Philippines) in a points win which came mostly from the clinch, and strong use of the teep push-kick. Lena who is just returning after a two-year lay-off from amateur muaythai now makes three Singaporean athletes still in the medal running. Tomorrow is a Rest Day before the semi-finals on Monday. Any athletes not competing will take part in the annual Walk For a Million Charity event taking place around Macau tomorrow morning. IFMA Instagram (See the Stories for athlete interviews!) IFMA Twitter and of course live action on the IFMA Youtube Channel.